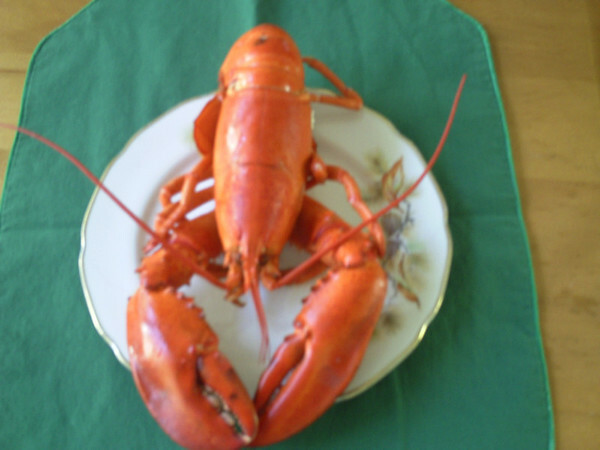 to me lobster is just another kind of fish. It is sweet and juicy. speckled trout the best though. fish food like gaspereau, mackerel, smelts and trout. later some things about ga't (eel) pronounced gaad. Right now it is easy to get lobster so we settled for that. Food-o-meter - 10/10 Liked everything again today. Health rating - 8/10 Sugar in the banana and the lemonade. Bites - about 53. I got interested in my food and forget to count a bite or two. Pieces of hair - 0.
community use to feed individuals and Elders. can become overwhelming for a young mind. The value of eels in Mi'kmaqi is, even today, not driven by economics. Mi'kmaq home you are offered eel stew. the transition between the two worlds. (bake, barbeque or over a traditional open fire). the participants speak in the Mi'kmaq language. of the year, mostly respecting spawning cycles. Mostly the eel is a source of food for the Mi'kmaq and is life-sustaining. planned for three days of Mi'kmaq lunches but we could have done more. kids who do not have as much as we do. Thank you "Lobster" and Uncle for all the wonderful information on Eels. 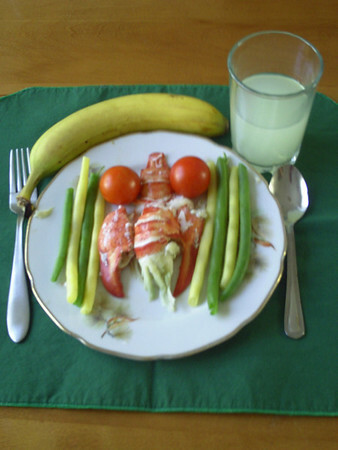 I've never eaten eel, and am not fond of lobster, even though my husband loves it. I would love to know more about the traditional medicines you make from the Eel. Thank you both so much for the reminders to keep asking questions, particularly as we grow older, so we may continue to learn new things! It was a fascinating trek to a world I have only heard a little bit about. I, too, hope you are able to bring us more stories in the future. This is so cool! I saw that the post was talking about Mi'kmaq people, and I thought, "We have a big Mi'kmaq population in Nova Scotia!" (where I'm from - I live in the capitol city of Halifax). So cool to see that it is in fact people from Nova Scotia showcasing their local food worldwide!! Hope Your schooldinners turn out at least a bit as healthy as the meals You've already shown to us. And we had to be quite carefull when we removed the intestines, cause if the gallbladder of the eel is damaged, it's fluids would ruin the whole eel..
Usually the skinned eel was cut into bits about 3" long, then fried and served with a creamy fish sauce with herbs - Dill and Parsley - and potatoes. We had no use for the eelskin, but considering hough tough but also flexible it was, using it for the things mentioned is a perfect example of using all resources available. planned for three days of Mi'kmaq lunches but we could have done more." Find out from your uncle of some other family member how to start your own blog. Get VEG to give you a little publicity and you never know. You might get a lot of followers, too. Even if it only goes as far out as family and friends you will lean a lot and I'm sure they will, too. I am immensely proud of your posts that have captured such a vibrant and fascinating look at the Mi'kmaq and other Aboriginal groups on Turtle Island. You remind us all that we are not above any animal, that we live in harmony with our environment and we need to be thankful for all the food and goods that we make from them. It is such a complicated thing to have so many treaties and laws that govern your relationship with the land and your food supply. Before Europeans arrived your people lived in harmony with the animals and plants, taking only what you needed and giving thanks. I hope that you can carry on your ways into the future and keep your culture strong for your children. Jagej is very lucky to have such guidance. If only everyone ate locally and in harmony with the planet, we would have so much less disease and such a healthier planet. I want to thank VEG and her family for having you as guest bloggers, it has been magnificently refreshing for all of us to read. I've really enjoyed your posts this week. They are very informative and I especially love the traditions around hunting and gathering food. Todays lunch looks fantastic ! I eat a little bit of seafood but no meat/poultry so I'd enjoy todays lunch much more than yesterdays :) Although those blueberries looked really good. Magen is so lucky that he gets lobster! I only get burgers and pizza! Is his school a private school? I love seafood, too. And eels. In Japanese cooking, eels are called "unagi." We eat them on top of rice with some sauce and it's yummy. Jagej, thank you for teaching us so many wonderful things about the Mi'kmaq people and your traditions. The Mi'kmaq people are not the only population group with increased amounts of illnesses such as diabetes and heart problems as a result of their more "modern" diets. Having said that, I don't think you needed to be downgrading your meals on the health scale because of natural sugars in things like fruits. Even a small amount of refined sugar, such as to make your lemonade. The biggest difference is that fruits and vegetables also contain more good stuff our bodies need (like other vitamins including antioxidants, and fiber). Whereas straight sugar from the sugar bowl contains nothing but pure sugar. So here's how it goes: Okay, carbohydrates break down into sugar, and sugar is "bad" for you, so we'd better not eat any more carbohydrates, right? We'll just eat fats and proteins. But ounce for ounce (or gram for gram), fats contain a bit more than twice the calories that carbohydrates and proteins do. So you will gain weight if you eat lots of fats. And we know that certain kinds of fats cause problems in our blood and can make you have heart disease. So we better not eat any fats either, right? That just leaves us with protein. And about the only "pure protein" food that doesn't contain any fats or carbohydrates is egg whites. So we'll just live on egg whites, okay? Except that too much protein in your diet can seriously strain your kidneys. We need our kidneys working properly to remove the waste products from our blood. Which means we shouldn't eat anything! But, if we do that, we'll die of starvation. Hmmmm, what to do??? Truth is that there are no foods that are "bad" or "good." Some are better than others. Some we need to use more moderation in eating than others. But we need all three: carbohydrates, fats and proteins, to be healthy. When we run into trouble is when we start eating too much of one particular thing. Too much sugar. Or too much fat. Or too much protein. This is why we want to eat a "balanced" diet. I would rate all of your meals you've shared with us as 10/10 on the healthy scale. Don't assume that just because yogurt has a bit of fat in it, that it's unhealthy. Or that since fruit has sugars in it, it's unhealthy. I just want to add something to it: Though sugar itself isn't "bad", the problem with most industrially processed foods is, that they contain a lot of hidden sugar. Because a while ago everybody was told that fats are bad - which they aren't, if consumed in the right amounts - everybody wants to eat low-fat options of anything. But there's a big problem with that. Low-fat usually means less taste, too, because fat is a natural taste enhancer. Just imagine a real good steak - it tastes a lot better if there's fat within the meat and the reason why those japanese Kobe beef steaks are so good is because there's all those little pieces of fat within the meat. So if you remove the fats from something, you have to add something to enhance the taste again. And most often that is done by adding sugar (in one form or another). And not only in foodstuff which would be expected to contain sugar. You might better take a closer look at what you eat and - as has been done on this blog already - assess the amount of sugar in your meal by putting up the same weight of sugarcubes besides it. And don't forget that starch - contained in bread, potatoes and many vegetables - is only a special kind of sugar when you do your maths..
Oh, and there are some scientists that even think of sugar as a kind of drug comparable to alcohol or tobacco. I wasn't aware that bananas or blueberries were "industrially processed foods." Jagej, Uncle & Msit No'kmaq, gebmidèdmaqan. Did I write they are? They usually aren't. Unless, of course, You mean the dried versions of fruits and berries - banana chips for example - in which the amount of sugar really is a lot greater than in fresh fruits / berries of the same weight. 'Comes from taking out the water, Y'know..
What a lovely looking meal - and so healthy and fresh. It is good to see such wholesome food being served at home. I rarely eat processed food of any kind (for about the last 10 years) and feel so much better for it - it always amazes me when pushing my trolley around the supermarket to see how much over-refined, high-carb, high-sugar packaged goods are in other people's trolleys (I used to be the same, but I saw 'the light').